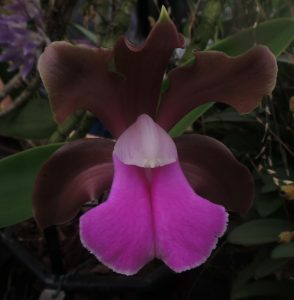 This dramatic orchid species is native to Brazil where it is found as an epiphyte on trees or lithophyte on rocks near the atlantic coast or inland in damp forests up to around 1200m. It is reported as restricted to rocks near water in dryer areas. We grow plants in baskets of course bark but keep them well watered through the summer which is the wet season in the wild, and dont let pseudo bulbs shrivel when kept a little dryer in the winter. We grow the species in Warm Americas (min 15C) though the range of the plant indicates that it could be grown a little warmer too.